Perceptrons [artificial neural networks] are not intended to serve as detailed copies of any actual nervous system. They are simplified networks, designed to permit the study of lawful relationships between the organization of a nerve net, the organization of its environment, and the “psychological” performances of which the network is capable. Perceptrons might actually correspond to parts of more extended networks in biological systems… More likely, they represent extreme simplifications of the central nervous system, in which some properties are exaggerated, others suppressed. No algorithm exists for the metaphor, nor can a metaphor be produced by means of a computer’s precise instructions, no matter what the volume of organized information to be fed in. Rather than reiterating GOFAI—that is, the top-down application of logic to information retrieved from the world—this text tries to frame the transmutation of external information into internal logic in the machination of neural networks. Within neural networks (as according also to the classical cybernetic framework), information becomes control; that is, a numerical input retrieved from the world turns into a control function of the same world. More philosophically, it means that a representation of the world (information) becomes a new rule in the same world (function), yet under a good degree of statistical approximation. Information becoming logic is a very crude formulation of intelligence, which however aims to stress openness to the world as a continuous process of learning. The transformation of information into higher functions can probably be detected at different stages in the history of intelligent machines: this text highlights only the early definition of information and feedback loops before analyzing their ramification into neural networks. The metamorphosis of an information loop into higher forms of knowledge of the world was the concern of Second-Order Cybernetics across the 1970s, but it was already exemplified by Rosenblatt’s neural networks at the end of the 1950s.3 In order to understand how neural networks transform information into logic, it might be helpful then to deconstruct the traditional reception of both the concepts of information and information feedback. Usually Claude Shannon is castigated for the reduction of information to a mathematical measure according to channel noise.4 In the same period, more interestingly, Norbert Wiener defined information as decision. If each unit of information is a unit of decision, an atomic doctrine of control is found within information. If information is decision, any bit of information is a little piece of control logic. Bateson will famously add that “information is a difference that makes a difference,” preparing cybernetics for higher orders of organization.6 In fact, Second-Order Cybernetics came to break the spell of the negative feedback loop and the obsession of early cybernetics with keeping biological, technical and social systems constantly in equilibrium. A negative feedback loop is defined as an information loop that is gradually adjusted to adapt a system to its environment (regulating its temperature, energy consumption, etc.). A positive feedback loop, on the contrary, is a loop that grows out of control and brings a system far from equilibrium. Second-Order Cybernetics remarked that only far-from-equilibrium systems make possible the generation of new structures, habits and ideas (it was Nobel Prize Ilya Prigogine who showed that forms of self-organization nevertheless occur also in turbulent and chaotic states).7 If already in the basic formulation of early cybernetics, the feedback loop could be understood as a model of information that turns into logic, that morphs logic itself to invent new rules and habits, only Second-Order Cybernetics seems to suggest that it is the excessive ‘pressure’ of the external world that forces machinic logic to mutate. 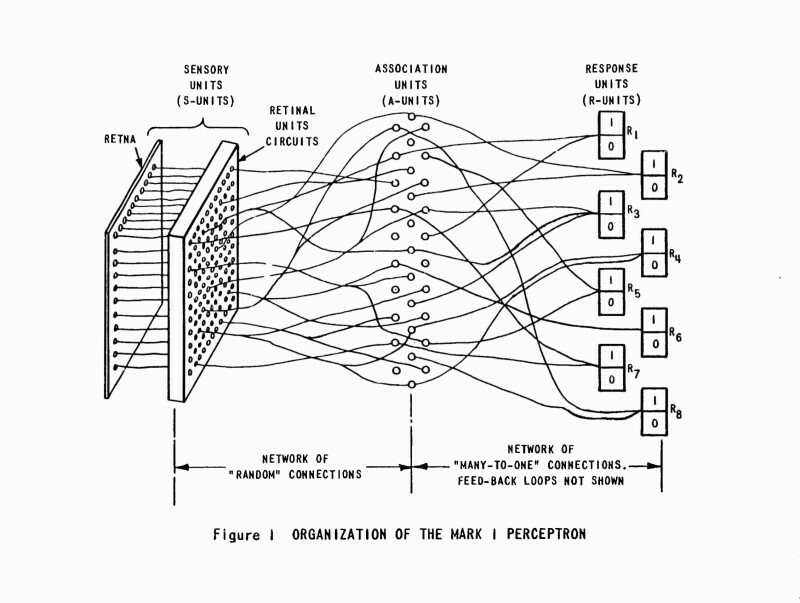 Diagram of the organisation of the Mark 1 Perceptron. Source with feedback loop not shown. Source: Frank Rosenblatt, Mark I Perceptron Operators’ Manual. Buffalo, NY: Cornell Aeronautical Laboratory, 1960. In 1961, Rosenblatt published Principles of Neurodynamics: Perceptrons and the Theory of Brain Mechanism, which would influence neural computation until today (the term Multi-Layer Perceptron, for example, is already here). The book moves from psychological and neurological findings on neuroplasticity and applies them to the design of neural networks. 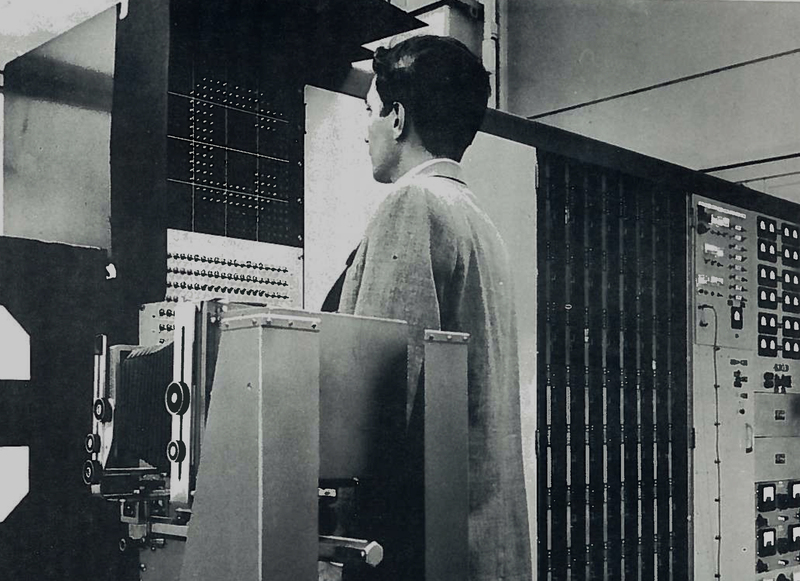 The Perceptron was an artifactual model of the brain that was intended to explain some of its mechanisms without being taken for the brain itself. (In fact, neural networks were conceived by imitating the eye’s rather than the brain’s neurons, and without knowing how the visual cortex actually elaborates visual inputs). Rosenblatt stressed that artificial neural networks are both a simplification and exaggeration of nervous systems and this approximation (that is the recognition of limits in model-based thinking) should be a guideline for any philosophy of the (artefactual) mind. Ultimately Rosenblatt proposed neurodynamics as a discipline against the hype of artificial intelligence. In terms of media archaeology, the neural network invention can be described as the composition of four techno-logical forms: scansion (discretization or digitization of analog inputs), logic gate (that can be realized as potentiometer, valve, transistor, etc. ), feedback loop (the basic idea of cybernetics), and network (inspired here by the arrangement of neurons and synapses). Nonetheless, the purpose of a neural network is to calculate a statistico-topological construct that is more complex than the disposition of such forms. The function of a neural network is to record similar input patterns (training dataset) as an inner state of its nodes. Once an inner state has been calculated (i.e., the neural network has been ‘trained’ for the recognition of a specific pattern), this statistical construct can be installed in neural networks with identical structure and used to recognize patterns in new data. The logic gates that are usually part of linear structures of computation acquire, in the parallel computing of neural networks, new properties. In this sense, Rosenblatt gave probably one of the first descriptions of machine intelligence as emergent property: “It is significant that the individual elements, or cells, of a nerve network have never been demonstrated to possess any specifically psychological functions, such as ‘memory,’ ‘awareness,’ or ‘intelligence.’ Such properties, therefore, presumably reside in the organization and functioning of the network as a whole, rather than in its elementary parts.”17 Yet neural networks are not horizontal but hierarchical (layered) networks. Each neuron of the network is a transmission node, but also a computational node; it is information gate and logic gate. Each node has then two roles: to transmit information and to apply logic. The neural network ‘learns’ as the wrong output is redirected to adjust the error of each node of computation until the desired output is reached. Neural networks are much more complex than traditional cybernetic systems, since they instantiate a generalized feedback loop that affects a multitude of nodes of computation. In this sense, the neural network is the most adaptive architecture of computation designed for machine learning. The generalized feedback affects the function of each node or neuron; that is, the way a node computes (its ‘weight’). The feedback that controls the computation of each node (what is variously termed weight adjustment, error backpropagation, etc.) can be an equation, an algorithm, or even a human operator. In one specific instance of neural network, by modifying a node threshold, the control feedback can change an OR gate into an AND gate, for example—which means that the control feedback changes the way a node ‘thinks.’19 The logic gates of neural networks compute information in order to affect the way they will compute future information. In this way, information affects logic. The business core of the main IT companies today is about finding the most effective formula of the neural control feedback. More specifically, the neural network learns how to recognize a picture by recording the dependencies or relations between pixels and statistically composing an internal representation. In a photo of an apple, for instance, a red pixel may be surrounded by other red pixels 80% of the time, and so on. In this way also, unusual relations can be combined in more complex graphical features (edges, lines, curves, etc.). Just as an apple has to be recognized from different angles, an actual picture is never memorized, only its statistical dependencies. The statistical graph of dependencies is recorded as a multidimensional internal representation that is then associated to a human-readable output (the word ‘apple’). This model of training is called supervised learning, as a human decides if each output is correct. Unsupervised learning is when the neural network has to discover the most common patterns of dependencies in a training dataset without following a previous classification (given a dataset of cat pictures, it will extract the features of a generic cat). Peirce said that “man is an external sign.”21 If this intuition encouraged philosophers to stress that the human mind is an artifactual project that extends into technology, however, the human mind’s actual imbrication with the external machines of cognition happened to be rarely empirically illustrated. This has produced simplistic poses in which ideas such as Artificial General Intelligence and Superintelligence are evoked as alchemic talismans of posthumanism with little explanation of the inner workings and postulates of computation. A fascinating aspect of neural computation is actually the way it amplifies the categories of human knowledge rather than supersedes them in autonomous forms. Contrary to the naïve conception of the autonomy of artificial intelligence, in the architecture of neural networks many elements are still deeply affected by human intervention. If one wants to understand how much neural computation extends into the ‘inhuman,’ one should discern how much it is still ‘too human.’ The role of the human (and also the locus of power) is clearly visible in (1) the design of the training dataset and its categories, (2) the error correction technique and (3) the classification of the desired output. For reasons of space, only the first point is discussed here. The design of the training dataset is the most critical and vulnerable component of the architecture of neural networks. The neural network is trained to recognize patterns in past data with the hope of extending this capability on future data. But, as has already occurred many times, if training data show a racial, gender and class bias, neural networks will reflect, amplify and distort such a bias. Facial recognition systems that were trained on databases of white people’s faces failed miserably at recognizing black people as humans. This is a problem called ‘over-fitting’: given abundant computing power, a neural network will show the tendency to learn too much, that is to fixate on a super-specific pattern: it is therefore necessary to drop out some of its results to make its recognition impetus more relaxed. Similar to over-fitting can be considered the case of ‘apophenia,’ such as Google DeepDream psychedelic landscapes, in which neural neural networks ‘see’ patterns that are not there or, better, generate patterns against a noisy background. Over-fitting and apophenia are an example of intrinsic limits in neural computation: they show how neural networks can paranoically spiral around embedded patterns rather than helping to reveal new correlations. Usually a neural network calculates statistical induction out of a homogenous dataset; that is, it extrapolates patterns that are consistent with the dataset nature (a visual pattern out of visual data, for example), but if the dataset is not homogenous and contains multidimensional features (for a very basic example, social data describing age, gender, income, education, health conditions of the population, etc. ), neural networks can discover patterns among data that human cognition does not tend to correlate. Even if neural networks show correlations unforeseen to the human mind, they operate within the implicit grid of (human) postulates and categories that are in the training dataset and, in this sense, they cannot make the necessary leap for the invention of radically new categories. Charles S. Peirce’s distinction between deduction, induction and abduction (hypothesis) is the best way to frame the limits and potentialities of machine intelligence. Peirce remarkably noticed that the classic logical forms of inference—deduction and induction—never invent new ideas but just repeat quantitative facts. Only abduction (hypothesis) is capable of breaking into new worldviews and inventing new rules. Specifically, Peirce’s distinction between abduction and induction can illuminate the logic form of neural networks, as since their invention by Rosemblaat they were designed to automate complex forms of induction. The distinction between induction as classifier and abduction as explainer frames very well also the nature of the results of neural networks (and the core problem of Artificial Intelligence). The complex statistical induction that is performed by neural networks gets close to a form of weak abduction, where new categories and ideas loom on the horizon, but it appears invention and creativity are far from being fully automated. The invention of new rules (an acceptable definition of intelligence) is not just a matter of generalization of a specific rule (as in the case of induction and weak abduction) but of breaking through semiotic planes that were not connected or conceivable beforehand, as in scientific discoveries or the creation of metaphors (strong abduction). In his critique of artificial intelligence, Umberto Eco remarked: “No algorithm exists for the metaphor, nor can a metaphor be produced by means of a computer’s precise instructions, no matter what the volume of organized information to be fed in.”25 Eco stressed that algorithms are not able to escape the straitjacket of the categories that are implicitly or explicitly embodied by the “organized information” of the dataset. Inventing a new metaphor is about making a leap and connecting categories that never happened to be logically related. Breaking a linguistic rule is the invention of a new rule, only when it encompasses the creation of a more complex order in which the old rule appears as a simplified and primitive case. Neural networks can a posteriori compute metaphors26 but cannot a priori automate the invention of new metaphors (without falling into comic results such as random text generation). The automation of (strong) abduction remains the philosopher’s stone of Artificial Intelligence. The current debate on Artificial Intelligence is basically still elaborating the epistemic traumas provoked by the rise of neural computation. It is claimed that machine intelligence opens up new perspectives of knowledge that have to be recognized as posthuman patrimony (see Lyotard’s notion of the inhuman), but there is little attention to the symbolic forms of pattern recognition, statistical inference, and weak abduction that constitute such a posthuman shift. Besides, it is claimed that such new scales of computation constitute a black box that is beyond human (and political) control, without realizing that the architecture of such black box can be reverse-engineered. The following passages remark that the human can still break into the ‘inhuman’ abyss of deep computation and that human influence is still recognizable in a good part of the ‘inhuman’ results of computation. The problem is once again clearly perceived by the military. DARPA (the research agency of the US Defense) is studying a solution to the black box effect under the program Explainable Artificial Intelligence (XAI).28 The scenario to address is, for example, a self-driving tank that turns into an unusual direction, or the unexpected detection of enemy weapons out of a neutral landscape. 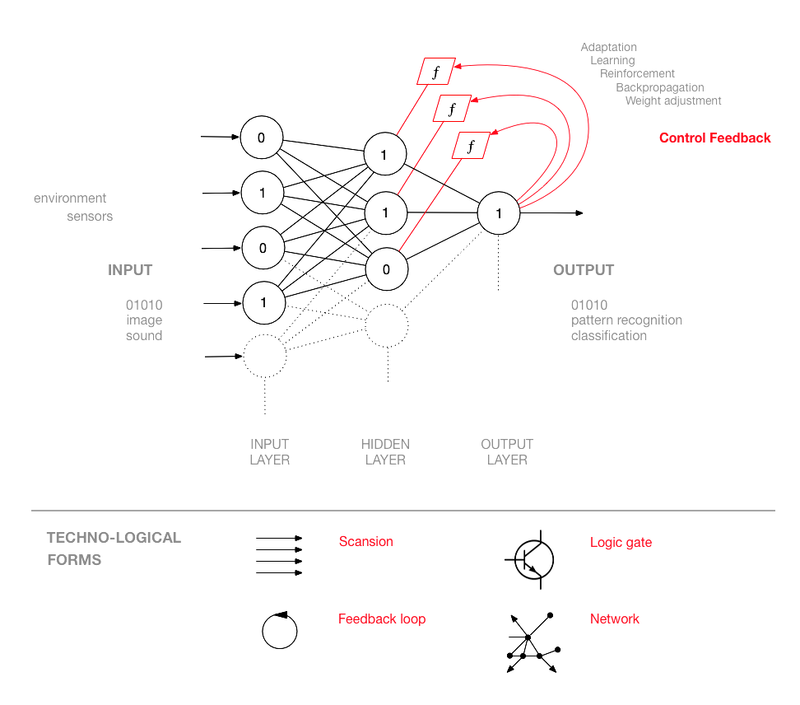 The idea of XAI is that neural networks have to provide not just an unambiguous output but also a rationale (part of the computational context for that output). If, for example, the figure of an enemy is recognized (“this image is a soldier with a gun”), the system will say why it thinks so—that is, according to which features. Similar systems can be applied also to email monitoring to spot potential terrorists, traitors, and double agents. The system will try not just to detect anomalies of behavior against a normal social pattern, but also to give explanations of which context of elements describe a person as suspect. As the automation of anomaly detection has already bred its casualties (see the Skynet affair in Pakistan),29 it is clear that XAI is supposed to preempt also further algorithmic disasters in the context of predictive policing. Explainable Artificial Intelligence (to be termed more correctly, Explainable Deep Learning) adds a further control loop on top of the architecture of neural networks, and it is preparing a new generation of epistemic mediators. This is already part of a multi-billion business interest as insurance companies, for instance, will cover only those self-driving cars that will provide “computational black box” featuring not just video and audio recordings but also the rationale for their driving decisions (imagine the case of the first accident between two self-driving vehicles). Inhuman scales of computation and the new dark age aesthetics have already found their legal representatives. In order to understand the historical impact of Artificial Intelligence, this text stresses that its hegemonic and dominant paradigm to date is not symbolic (GOFAI) but connectionist, namely the neural networks that constitute also Deep Learning systems. What mainstream media call Artificial Intelligence is a folkloristic way to refer to neural networks for pattern recognition (a specific task within the broader definition of intelligence and, for sure, not an exhaustive one). Patter recognition is possible thanks to the calculus of the inner state of a neural network that embodies the logical form of statistical induction. The ‘intelligence’ of neural networks is, therefore, just a statistical inference of the correlations of a training dataset. The intrinsic limits of statistical induction are found in between over-fitting and apophenia, whose effects are gradually emerging in collective perception and governance. The extrinsic limits of statistical induction can be illustrated thanks to Peirce’s distinction of induction, deduction, and abduction (hypothesis). It is suggested that statistical induction gets closer to forms of weak abduction (e.g., medical diagnosis), but it is unable to automate strong abduction, as it happens in the discovery of scientific laws or the invention of linguistic metaphors. This is because neural networks cannot escape the boundary of the categories that are implicitly embedded in the training dataset. Neural networks display a relative degree of autonomy in their computation: they are still directed by human factors and they are components in a system of human power. For sure, they do not show signs of ‘autonomous intelligence’ or consciousness. Super-human scales of knowledge are acquired only in collaboration with the human observer, suggesting that Augmented Intelligence would be a more precise term than Artificial Intelligence. The author wishes to thank Anil Bawa-Cavia, Nina Franz, and Nikos Patelis for their comments. Frank Rosenblatt. Principles of Neurodynamics: Perceptrons and the Theory of Brain Mechanisms. Buffalo, NY: Cornell Aeronautical Laboratory, 1961. 28. Print. Umberto Eco. Semiotics and the Philosophy of Language. Bloomington: Indiana University Press, 1986. 127. Print. See Francis Heylighen and Cliff Joslyn. “Cybernetics and Second-Order Cybernetics” in Encyclopedia of Physical Science and Technology 19. Ed. R.A. Meyers. New York: Academic Press, 2001. Print. Claude Shannon. “A Mathematical Theory of Communication.” Bell System Technical Journal 27/3 (1948). Print. Norbert Wiener. Cybernetics: Or Control and Communication in the Animal and the Machine. Cambridge, MA: MIT Press, 1948. 61. Print. Weiner’s formulation happened to influence also Jacques Lacan’s 1955 lecture on cybernetics and psychoanalysis, in which logic gates are literally understood as “doors” that open onto or close off new destinies within the Symbolic order. Jacques Lacan. “Psychoanalysis and cybernetics, or on the nature of language.” The Seminar of Jacques Lacan 2. New York: Norton, 1988. Print. Gregory Bateson. Steps to an Ecology of Mind. Chicago: University of Chicago Press, 1972. Print. Gregoire Nicolis and Ilya Prigogine. Self-Organization in Nonequilibrium Systems. New York: Wiley, 1977. Print. Artificial General Intelligence (AGI) is often the attempt to meet top-down (symbolic) with bottom-up (connectionist) approaches halfway, that is to combine symbolic deduction with statistical induction. To date, however, only the connectionist paradigm of neural networks happened to be successfully automated, casting doubts on some metaphysical and centralizing premises of AGI. See Marvin Minsky. Theory of Neural-Analog Reinforcement Systems and Its Application to the Brain Model Problem. Dissertation. Princeton University, 1954. Print. Warren McCulloch and Walter Pitts. “A Logical Calculus of the Ideas Immanent in Nervous Activity.” Bulletin of Mathematical Biophysics 5/4 (1943). Print. And Warren McCulloch and Walter Pitts. “How We Know Universals the Perception of Auditory and Visual Forms.” Bulletin of Mathematical Biophysics 9/3 (1947). Print. Remarkably Paul Virilio’s book on machine vision was inspired also by the Perceptron (yet Virilio could not foresee that the Perceptron would become the hegemonic paradigm of machine intelligence in the early 21st century). See Ch. 5 in Paul Virilio. La Machine de vision: essai sur les nouvelles techniques de représentation. Paris: Galilée, 1988. Print. English translation: The Vision Machine. Bloomington: Indiana University Press, 1994. Print. Frank Rosenblatt. 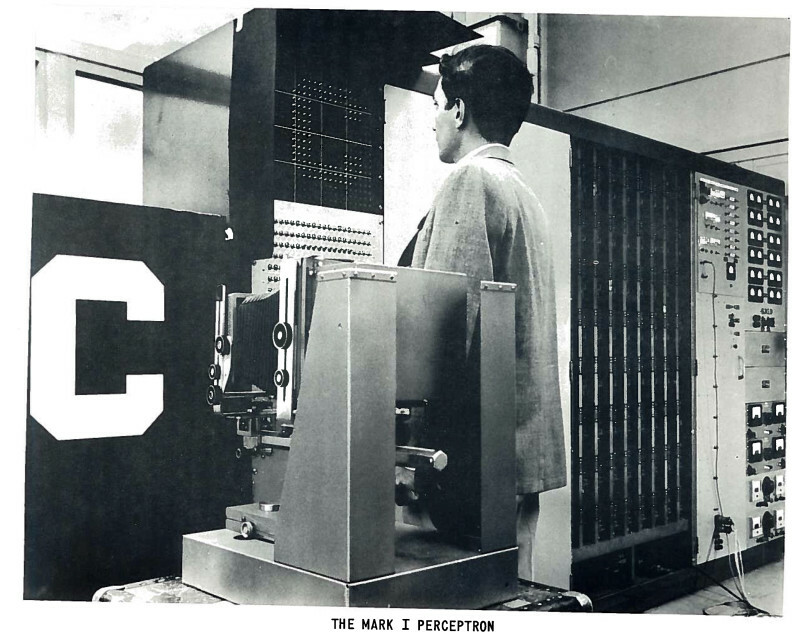 “The Perceptron a Perceiving and Recognizing Automaton.” Technical Report 85/460/1 (1957). 1-2. Print. Frank Rosenblatt. Op. cit. 1961. vii. Print. David Rumelhart and PDP Research Group. Parallel Distributed Processing: Explorations in the Microstructure of Cognition 1-2. Cambridge, MA: MIT Press, 1986. Print. Neural networks keep on growing towards even more complex topologies and have inaugurated a true computational ars combinatoria (see the diagrams of auto-encoder, Boltzmann machine, recurrent and Long Short-Term Memory neural network, Adversarial Generative Networks, etc.). Neural networks are the most articulated and sophisticated machines along the tradition of computable knowledge, as in the ancient Arab device zairja or Ramon Llull’s book Ars Magna (1305). See David Link. “Scrambling T-R-U-T-H: Rotating Letters as a Material Form of Thought.” Variantology 4. On Deep Time Relations of Arts, Sciences and Technologies in the Arabic–Islamic World. Eds. Siegfried Zielinski and Eckhard Fürlus. Cologne: König, 2010. Print. Frank Rosenblatt. Op. cit. 1961. 9. See Ethem Alpaydın. Introduction to Machine Learning. 2nd ed. Cambridge, MA: MIT Press, 2014. 260. Print. This is one specific case for illustration purposes. Activation functions operate also in different ways. On the attempts to automate weak abduction, see “Automatic Abductive Scientists” in: Lorenzo Magnani. Abductive Cognition. Springer Science & Business Media, 2009. 112. Print. Charles S. Peirce. “Some Consequences of Four Incapacities” (1868). The Essential Peirce 1 (1867-1893). Eds. Nathan Houser and Christian Kloesel. Bloomington: Indiana University Press, 1992. 54. Print. Ontology is here used in the sense of information science. Charles S. Peirce. Collected Papers. Cambridge, MA: Belknap, 1965. 5, 145. Print. Charles S. Peirce. “Deduction, Induction, and Hypothesis” (1878). Op cit. 1992. 194. Umberto Eco. Op. cit. 127. See Word2vec, a framework for the mapping of word embedding in vectorial space. This is true both in supervised and unsupervised learning. Thanks to Anil Bawa-Cavia for clarifying it. Matteo Pasquinelli. “Arcana Mathematica Imperii: The Evolution of Western Computational Norms.” Former West. Eds. Maria Hlavajova, et al. Cambridge, MA: MIT Press, 2017. Print. There are different approaches to machine intelligence, yet the hegemony of connectionism in automation is manifest. For an accessible introduction to the different families of machine learning, see Pedro Domingos. The Master Algorithm. New York: Basic Books, 2015. Print. Matteo Pasquinelli. “Abnormal Encephalization in the Age of Machine Learning.” e-flux 75 (September 2016). Web. “The special skill of each individual machine-operator, who has now been deprived of all significance, vanishes as an infinitesimal quantity in the face of the science, the gigantic natural forces, and the mass of the social labor embodied in the system of machinery, which, together with these three forces, constitutes the power of the master”. Karl Marx. Capital 1 (1867). London: Penguin, 1982. 549. Print. Matteo Pasquinelli is Professor in Media Theory at the University of Arts and Design, Karlsruhe.